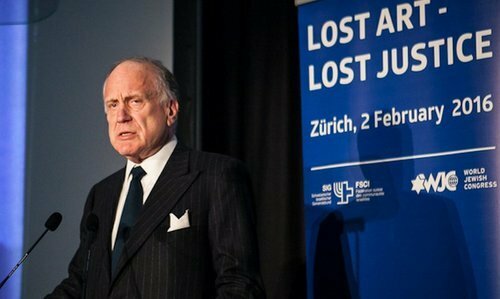 In a lecture in Zurich on Tuesday evening, World Jewish Congress (WJC) President Ronald S. Lauder urged Switzerland to address the issue of art works stolen by the Nazis prior to and during World War II. “Switzerland can now set the gold standard,” Lauder said. He explained why in his view “a crime committed 80 years ago continues to stain the world of art today.” The event at the Kunsthaus Zürich was hosted by the Swiss Federation of Jewish Communities (SIG/FSCI), whose president, Herbert Winter, remarked in his introduction that it was important that Switzerland was now providing important resources for provenance research in museums. In his speech, Ronald S. Lauder recalled that following the 1935 Nuremberg Laws put in place by the Nazis, German Jews had to sell off their possessions for a fraction of the true value in order to make ends meet. Lauder criticized the fact that today looted art is often not recognized for what it is. “Could it possibly make any difference if a painting was taken off the wall by a Nazi or if its Jewish owner was forced to sell that same painting to one of Hitler’s art dealers for almost nothing? Is there any difference in the outcome for the victim’s families?” Lauder asked. The WJC president urged Switzerland and other European countries to find fair and equitable solutions. Lauder said all art losses caused by Nazi-persecution had to be treated the same way, that provenance research should to be conducted pro-actively and museums be obligated to research their holdings, and that sufficient funds be provided for provenance research. Lauder called for complete transparency on all aspects of provenance research by means of a centralized database open for all museums, collectors, art dealers and historians. He urged the establishment of one independent commission to draw up proposals for fair and equitable solutions, and said auction houses often knowingly sold Nazi-looted art works and had to stop doing so. The debate about Nazi-looted art recently received a new impetus when the late Cornelius Gurlitt bequeathed his art trove, which includes at least some works that were looted by the Nazis, to the Kunstmuseum Bern in Switzerland. 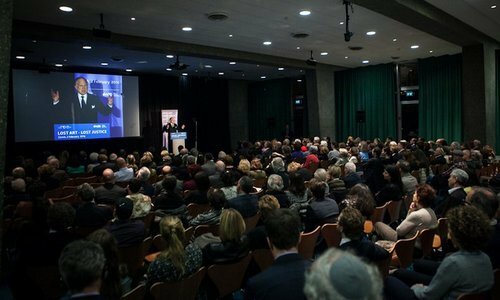 Herbert Winter, president of the Swiss Federation of Jewish Communities (SIG), expressed disappointment about the results of the task force set up by Germany in 2013 to check the provenance of the works in the Gurlitt trove. Winter praised the Kunstmuseum Bern for refusing to accept any looted art from the Gurlitt collection in Switzerland, and said it was important that Switzerland was now providing important resources for provenance research in museums. Winter said the Washington Declaration was an important document which needed to be applied not only by public institutions but also by those private collectors bound by it through their membership in associations that had signed the declaration. The SIG president appealed to Swiss art collectors to have their art works checked for provenance.